They say that music is the most accessible art form of all, and they’re probably right. But is the proposition from a curator’s viewpoint quite so black and white, particularly when, in the case of V&A custodian Vicky Broackes, the task is to fashion a display celebrating the artistic temperament of one of modern music’s true trendsetters. 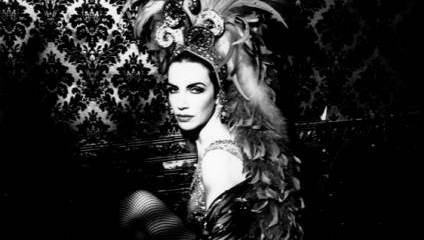 ‘The House of Annie Lennox’ exhibition is to be housed in the V&A’s Theatre and Performance Galleries for five months from September 15. One of 145 artistic selections on offer, and contributing only a fraction of the museum’s 4.5 million objects, it aims nevertheless to explore the creativity, image and style of the former Eurythmics singer and renowned solo artist, whilst celebrating the museum’s unrelenting passion for art and design, no matter what the medium. “In our Galleries we have the costumes of many great pop artists including Mick Jagger, Adam Ant and Brian Eno,” begins Vicky. “And in the past we have presented major exhibitions on modern icons such as Kylie Minogue. So that’s the proposition, but what about the logistics? And where are the boundaries when dealing with an artist who, in performance, screams extraversion, yet in creative mindset has been meticulous and even, at times, reserved (a fact borne out by the release of just five studio albums in two decades). “It can take anything from five months to a year for an exhibition to come together, and sometimes longer,” Vicky reveals. “We always stay in touch with performing artists across various fields, so we had the relationship in the first place. That made the display relatively easy to pull together. As curator of the exhibition, Vicky began by choosing the objects from Annie’s archive in order to represent her collection. Throughout, the artist was involved, contributing ideas for the display and its design, not least in choreographing a new film to be screened at the exhibition. Vicky continues: “Working with Annie was a pleasure. As an artist who is enthusiastic about communicating with the public, she not only has great vision but also supports what we strive to achieve at the V&A – a constant striving to inspire creativity. So within that, she has lent personal objects to us, recorded an interview and has thrown herself wholeheartedly into every aspect of the production. The centrepiece of the display is a house within a house, the place where Annie’s most personal objects are displayed – items including handwritten lyrics and diary entries. So what about the logistical challenge of collating and storing such items? And while the material art succeeds in itself in embracing music and performance through those costumes, plus awards and photography, there is video and music to complete the sensory experience. The aim and presentation is such that ‘The House of Annie Lennox’ is designed to be enjoyed by everyone, from the most ardent fan to someone unfamiliar with her work. “Obviously, at the V&A, we have criteria and yardsticks, and this display works on so many levels. It stands by itself, whilst also linking thematically to our major autumn exhibition ‘Postmodernism: Style and Subversion 1970-1990’ (to which Lennox is also lending a key costume), so we hope visitors will enjoy both. And Annie’s assessment? She told us, “I'm thrilled and delighted at the prospect of presenting ‘The House of Annie Lennox’ at the V&A. Even as a building itself, the Museum is one of the most wonderful treasures in the UK, and that's even before you start to look at its contents.